dDepartment of Radiology (S.-H.Y. ), Korea University Hospital, Seoul, Korea. BACKGROUND AND PURPOSE: The effect of delayed transit time is the main source of error in the quantitative measurement of CBF in arterial spin-labeling. In the present study, we evaluated the usefulness of the transit time–corrected CBF and arterial transit time delay from multiple postlabeling delays arterial spin-labeling compared with basal/acetazolamide stress technetium Tc99m-hexamethylpropylene amineoxime (Tc99m-HMPAO) SPECT in predicting impairment in the cerebrovascular reserve. 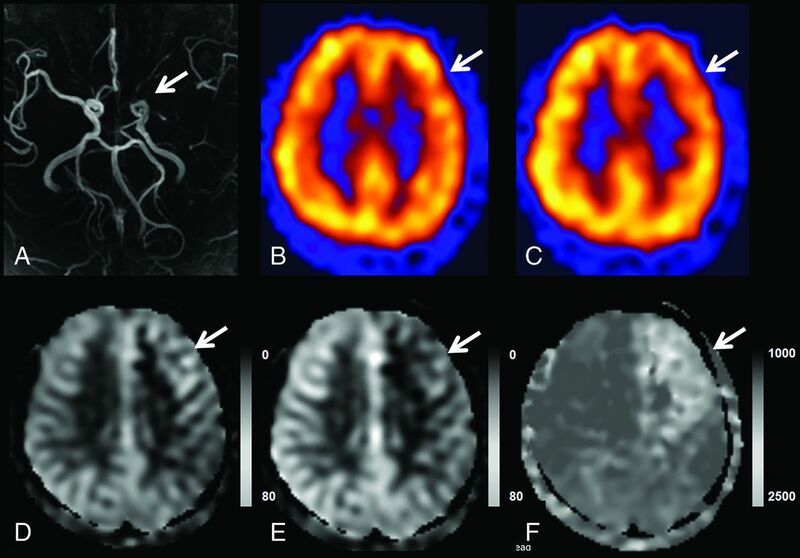 MATERIALS AND METHODS: Transit time–corrected CBF maps and arterial transit time maps were acquired in 30 consecutive patients with unilateral ICA or MCA steno-occlusive disease (severe stenosis or occlusion). Internal carotid artery territory–based ROIs were applied to both perfusion maps. Additionally, impairment in the cerebrovascular reserve was evaluated according to both qualitative and quantitative analyses of the ROIs on basal/acetazolamide stress Tc99m-HMPAO SPECT using a previously described method. The area under the receiver operating characteristic curve was used to evaluate the diagnostic accuracy of arterial spin-labeling in depicting impairment of the cerebrovascular reserve. The correlation between arterial spin-labeling and cerebrovascular reserve was evaluated. RESULTS: The affected hemisphere had a decreased transit time–corrected CBF and increased arterial transit time compared with the corresponding values of the contralateral normal hemisphere, which were statistically significant (P < .001). The percentage change of transit time–corrected CBF and the percentage change of arterial transit time were independently differentiating variables (P < .001) for predicting cerebrovascular reserve impairment. The correlation coefficient between the arterial transit time and cerebrovascular reserve index ratio was −0.511. CONCLUSIONS: Our results demonstrate that the transit time–corrected CBF and arterial transit time based on arterial spin-labeling perfusion MR imaging can predict cerebrovascular reserve impairment. Assessment of hemodynamic abnormalities is important for managing cerebral ischemia and patients with Moyamoya disease, and the cerebrovascular reserve (CVR) has been considered the most useful predictor of cerebral hemodynamics.1 Several brain perfusion imaging techniques have been used to evaluate the CVR, including PET, SPECT, CTP, and DSC perfusion MR imaging.2,3 However, all these techniques require bolus injections of a contrast medium or radioactive tracers. In this study, we present MP-ASL perfusion in unilateral steno-occlusive disease to predict the CVR relative to the widely used Tc99m-HMPAO basal/acetazolamide stress perfusion SPECT. This retrospective study was approved by the Seoul National University Hospital institutional review board. Between June 2015 and December 2016, ninety-eight consecutive patients with unilateral ICA or MCA steno-occlusive disease (severe stenosis [>70%] or occlusion) who had undergone ASL perfusion MR imaging and SPECT were included in this study. The exclusion criteria were as follows: 1) patients with contralateral moderate or severe stenosis, 2) a time interval between ASL perfusion MR imaging and SPECT of >1 month, and 3) poor image quality because of a previous hemorrhage or operation. Thirty patients were ultimately enrolled in this study. Eleven patients had undergone superficial temporal artery–middle cerebral artery anastomosis, and 1 patient had undergone proximal ICA stent placement. Four patients who had anastomosis surgery had preoperative and postoperative examination sets (preoperative ASL and SPECT and postoperative ASL and SPECT), and their images were analyzed separately. Consequently, 34 ASL and SPECT images from 30 patients were analyzed in this study. Two patients were diagnosed with unilateral Moyamoya disease, and 28 patients were diagnosed with non-Moyamoya steno-occlusive disease. All patients had severe stenosis or total occlusion of the unilateral ICAs or MCAs, as determined by MRA or DSA. There were 12 female and 18 male patients (a total of 30 patients with a mean age of 55.5 years and an age range of 16–82 years [male patients had a mean age of 59.2 years and age range of 48–82 years, and female patients had a mean age of 49.2 years and age range of 16–72 years]), with no significant difference in the age between male and female patients (P = .12). Patients had either distal ICA occlusion (n = 5), proximal ICA occlusion (n = 12), proximal ICA severe stenosis (n = 2), proximal MCA occlusion (n = 8), or proximal MCA/anterior cerebral artery occlusion (n = 3). Basal/acetazolamide brain perfusion SPECT was performed with a 1-day protocol. Basal SPECT images were acquired 5 minutes after intravenous injection of Tc99m-HMPAO (9.25 MBq per kilogram of body weight) using a triple-headed gamma camera (Triad XLT 9; Trionix Research Laboratory, Twinsburg, Ohio) equipped with low-energy ultra-high-resolution fan-beam collimators. Image acquisition was performed with a step-and-shoot mode with 40 steps for 20 seconds per step (total duration, 13.3 minutes). Ten minutes before the end of the basal SPECT, 14 mg/kg of acetazolamide was intravenously injected. Another dose of Tc99m-HMPAO (18.5 MBq per kilogram of body weight) was injected at the end of basal SPECT, and a second acquisition of SPECT was started 5 minutes later. 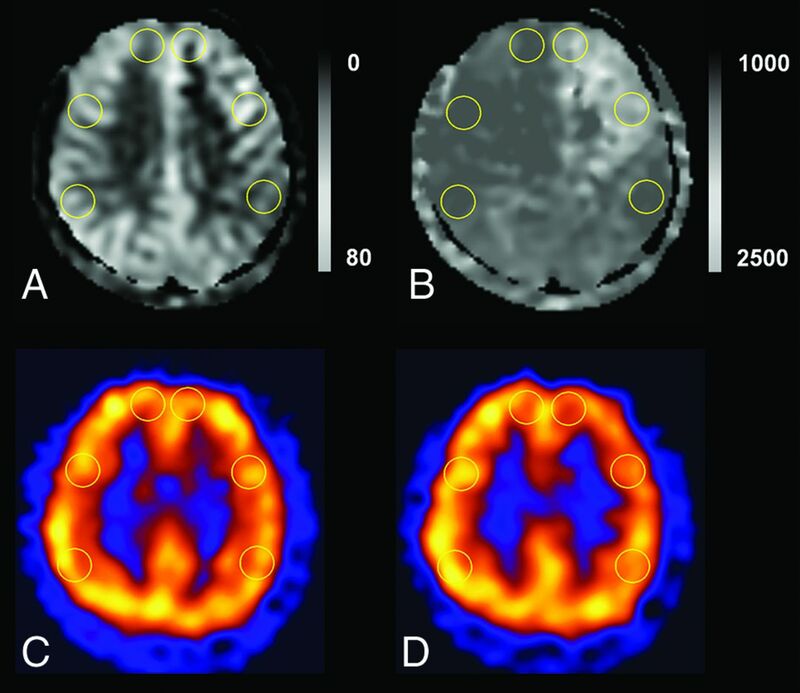 The acetazolamide stress perfusion images were generated by using decay-corrected subtraction of the basal images from the corresponding stress images. All SPECT images were reconstructed on 128 × 128 matrices by using a filtered back-projection method with a Butterworth filter. All MR imaging and basal/acetazolamide SPECT scans were reviewed by board-certified reviewer 1 (H.J.C. with 6 years of experience in radiology). Unclear interpretations were subsequently resolved in consensus with board-certified reviewer 2 (C.H.S. with >20 years of experience in radiology). The same analysis was performed by board-certified reviewer 3 (S.H.Y. with 6 years of experience in radiology). On ASL MR imaging, ROIs were drawn in the gray matter of the major territories of the intracranial arteries and the equivalent site on the contralateral normal side on the ATT and transit time–corrected CBF (TCF) maps directly in the workstation (Fig 1). The ROIs were placed in 6 locations (2 bilateral anterior cerebral artery territories and 4 bilateral MCA territories) on the supraventricular level over a fixed territory in all patients to avoid the infarcted area. ATT [ms] and TCF [mL/100 g/min] were obtained in each territory. The percentage change of TCF is calculated as 100 × [(TCFcontralateral normal − TCFipsilateral affected)/TCFcontralateral normal], and the percentage change of ATT is calculated as 100 × [(ATTcontralateral normal − ATTipsilateral affected)/ATTcontralateral normal]. ROI placements in supraventricular levels on ASL and SPECT. We drew the ROIs in the bilateral anterior cerebral artery territories and anterior and posterior MCA territories in TCF (A), ATT (B), baseline SPECT (C), and acetazolamide challenge SPECT (D). We also drew an ROI in the ipsilateral cerebellum with the highest uptake on visual assessment for normalization of SPECT values. The SPECT data were assessed qualitatively and quantitatively. Regions of known old infarction with perfusion defects were not included for visual grading. The visual grades of reduced CVR were classified into 1 of 2 grades, preserved or impaired. Impairment of the CVR was defined as no increase or decrease in perfusion in acetazolamide stress SPECT compared with basal SPECT. Visual grading was performed on each side of the hemispheres relative to the normal contralateral side. To evaluate the ability of the ATT delay and TCF to predict impairment of the CVR, we performed a receiver operating characteristic (ROC) curve analysis to identify the optimal threshold for maximizing the sensitivity and specificity. In addition, pair-wise comparisons of the ROC curves were performed to compare the diagnostic accuracy of TCF, the percentage change of TCF ATT, and the percentage change of ATT. The correlation between ASL parameters and SPECT-derived CVRindex was determined by the Pearson correlation coefficient. Interobserver agreement for qualitative analysis of CVR in SPECT was evaluated by the weighted κ coefficient. The quantitative analysis for the CVRindex on SPECT and the quantitative analysis for ATT and TCF on ASL were assessed with the intraclass correlation coefficient. Weighted κ values or intraclass correlation coefficient of <0.20, 0.21–0.40, 0.41–0.60, 0.61–0.80, and 0.81–1.00 represented poor, fair, moderate, good, and excellent agreement, respectively.28 All statistical analyses were performed with SPSS statistics, Version 20.0 (IBM, Armonk, New York); R statistical and computing software (http://www.r-project.org/); and MedCalc Statistical Software, Version 17.1 (MedCalc Software, Mariakerke, Belgium). A P value < .05 was considered statistically significant. The mean interval between ASL and SPECT examinations was 1.7 ± 4.9 days (range, 0–28 days). Table 1 shows the mean absolute values of ASL parameters of the affected and contralateral unaffected ROIs. The affected ROIs had a decreased TCF and increased ATT compared with the corresponding values of the contralateral normal unaffected ROIs, which were statistically significant (P < .001). Because a higher correlation was noted in the MCA territory than in the anterior cerebral artery territory, we focused on the MCA territory in subsequent results. In qualitative assessment of baseline and acetazolamide challenge SPECT, 20 patients (66.67%) showed impairment of CVR on the affected side. Eight patients (26.67%) showed preserved CVR even in ipsilateral steno-occlusive disease. In addition, we evaluated 136 ROIs: Fifty ROIs showed impaired CVR and 86 ROIs showed preserved CVR. Four patients who had bypass surgery showed impaired CVR on qualitative assessment in preoperative and postoperative SPECT. Results pertaining to the diagnostic performance of TCF and ATT in predicting CVR impairment based on a qualitative assessment of SPECT data are summarized in Table 2. The percentage change of TCF showed the best area under the curve value (0.905) in predicting CVR impairment. A significant difference was found in the pair-wise comparison of the areas under the ROC curve between TCF and the percentage change of transit time (difference between areas = 0.083, P = .015). Otherwise, there was no significant difference among the areas under the ROC curve. A representative case of TCF and ATT used in depicting the CVR impairment is shown in Fig 2. A representative case of the use of the TCF and ATT maps in depicting CVR impairment. TOF MRA (A) demonstrates left proximal MCA occlusion. Basal/acetazolamide Tc99m-HMPAO SPECT images (B and C) show normal perfusion on basal SPECT and decreased perfusion in the left frontal lobe (MCA M2, superior division territory) on acetazolamide challenge SPECT, which indicates impairment of the CVR in this region. In ASL without a time correction (D), there is no hypoperfusion; however, TCF from MP-ASL (E) demonstrates decreased perfusion and delayed ATT (F). The correlation between ASL parameters and SPECT-derived parameters is summarized in Fig 3. The TCF showed a positive correlation with the CVRindex or rCVRindex, and the ATT showed a negative correlation with the CVRindex or rCVRindex (P < .001, respectively). 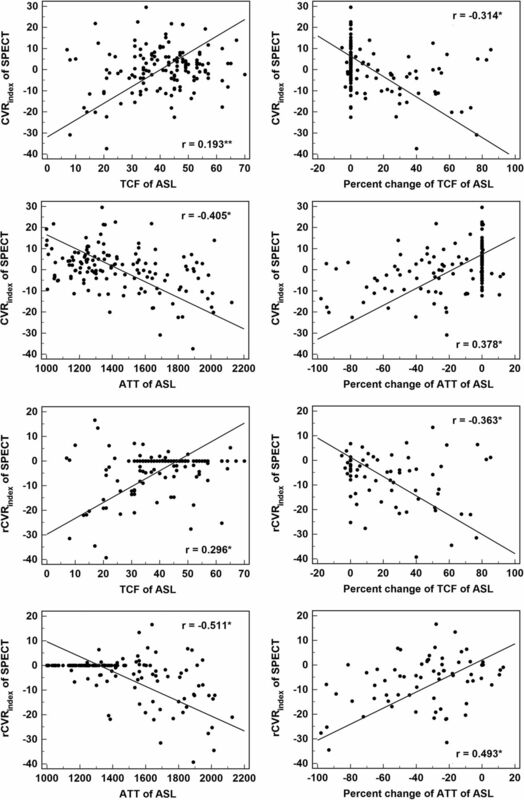 Scatterplots and Pearson correlation coefficients between values of ASL and SPECT of MCA territories (the asterisk indicates P < .001; double asterisks, P = .007). Interobserver agreement for the visual assessment of the impairment of CVR based on SPECT (weighted κ = 0.950), measurement of the basal CBF in SPECT (intraclass correlation coefficient = 0.964), acetazolamide challenge CBF in SPECT (intraclass correlation coefficient = 0.968), TCF in ASL (intraclass correlation coefficient = 0.902), and the ATT in ASL (intraclass correlation coefficient = 0.966) was excellent. The present study demonstrated that TCF and ATT measurements made by MP-ASL can predict CVR without acetazolamide in patients with unilateral steno-occlusive disease. Therefore, ASL can reduce the number of examinations for patients who require frequent follow-up to evaluate CVR without the acetazolamide challenge SPECT. Many studies have examined the relationship between hemodynamic parameters and metabolic reserve. Based on a PET study, Gibbs et al29 suggested that the ratio CBF/CBV (reciprocal of the MTT) is an index of diminishing cerebral perfusion pressure, and even without a measurement of the regional oxygen extraction ratio, the MTT can provide the best predictive value for cerebrovascular reserve. Schumann et al30 also demonstrated that the MTT was linearly correlated with cerebral perfusion pressure under physiologic conditions and may be sensitive to metabolic reserve consumption. Vagal et al5 reported that the MTT is 1 of 3 general approaches for assessing CVR in the same position as CBF measurements by the acetazolamide challenge and direct oxygen extraction fraction measurements. The MTT determination based on perfusion CT or DSC-MR imaging showed a strong correlation with CVR in patients with chronic vascular occlusive disease.31⇓–33 The ATT is different from the MTT; however, it has been reported that there was significant correlation between the ATT and MTT (r = 0.604, P = .01).16 To the best of our knowledge, there is no prior study about the correlation between the ATT and the CVR based on SPECT with acetazolamide challenge. With respect to predicting the CVR from baseline SPECT CBF scans, we found a poorer correlation between baseline CBF and CVRindex (r = −0.279, P = .021) than for ATT or TCF and no significant correlation between baseline CBF and rCVRindex (r = −0.058, P = .637). These results are like those of studies indicating that CBF has no correlation with CVR or a poorer correlation than the MTT.3,34 However, we observed a better correlation between the percentage change in the TCF and rCVRindex (r = −0.363, P < .001). The percentage change in the TCF showed excellent diagnostic performance in predicting CVR with a sensitivity of 84.00%, specificity of 97.67%, and an area under the ROC curve of 0.905. In addition, the correlation between the ATT and rCVRindex was moderate (r = −0.511, P < .001). The ATT showed excellent diagnostic performance in predicting CVR with a sensitivity of 82.00%, specificity of 88.37%, and an area under the ROC curve of 0.891. According to our results, the TCF and ATT have potential value in predicting CVR. Single PLD ASL imaging provides rapid and robust measurements of CBF. However, the method does not provide measurements of the ATT. ATT prolongation causes underestimation of CBF, and such effects might be particularly important in patients with steno-occlusive diseases. In a recent recommendation for the clinical application of ASL from the International Society for Magnetic Resonance in Medicine consensus, the authors mentioned that the complex-but-efficient Hadamard time-encoding strategies of ASL can provide additional information of the estimation of ATT and the most precise quantitation of CBF, especially in steno-occlusive disease.12 The MP-ASL speeds imaging and efficiently improves the SNR.22 Additionally, we found the feasibility of MP-ASL in predicting CVR in patients with steno-occlusive disease who had a long transit time from labeling to scanning without the use of a vasodilatory stimulus (such as acetazolamide) or contrast (iodinate or gadolinium base). This protocol encoded 7 different PLD times with the application of 7 effective label durations. Because the ASL signal increases with label duration, Alsop et al12 suggested a labeling duration of 1.8 seconds as a compromise between an increase in the SNR and the disadvantage of greater power deposition and T1 sensitivity in a single postlabeling delay ASL. We used 7 shorter effective label durations (range, 0.22–1.18 seconds) than the duration recommended by Alsop et al. A previous study demonstrated a trade-off between systematic error and the SNR using standard continuous ASL versus the Hadamard continuous arterial spin-labeling method.22 Because Hadamard encoding can remove transit time–related systematic errors, it holds an advantage for clinical applications, particularly for patients with steno-occlusive disease, for whom the range of prolonged ATT values is variable or unknown. Acetazolamide acts quickly: an increase of CBF up to 53% ± 24% in 3 minutes after 1 g of acetazolamide administration.37 The SPECT protocol in this study was administration of acetazolamide 10 minutes before the end of baseline SPECT. One of the purposes of the protocol is to save time to avoid motion artifacts. Acetazolamide can be injected during the baseline scan to optimize the effect of the drug at the end of the test. The Tc99m-HMPAO that we use for imaging is characterized by being fixed in the brain within 2 minutes after injection.38 Even if other medications are introduced in the middle of the scan (and even if the blood flow is changed), the fixed status does not change. This study has a few limitations. First, we did not divide the patient group into atherosclerotic stenosis and unilateral Moyamoya disease groups, which are different pathophysiologies of vascular stenosis, collateral formation, and consequent arterial transit delay.39 However, this protocol covered a long PLD (the longest postlabeling time was 3.32 seconds), which would not be affected by the long ATT. Second, we used SPECT as a reference standard for CVR impairment rather than PET, which has usually been considered a standard for CBF quantification. However, some studies have shown that SPECT can be an alternative method for CBF assessment in patients with cerebrovascular disease.40 Third, because the measurements of CVR and CVRindex were made via a 1-day protocol of Tc99m-HMPAO SPECT with a split dose, we should normalize the values by the ipsilateral cerebellum or contralateral equivalent normal side to obtain the adjusted quantification. Fourth, we did not control for conditions that could cause variations in CBF, such as caffeine, time of day, or diet, and the examinations were not performed back to back.41 We used percent change of values and asymmetric ratio in addition to the absolute values to reduce uncontrolled variations. MP-ASL can predict cerebrovascular reserve without acetazolamide in patients with unilateral steno-occlusive disease. ASL can provide a potential noninvasive imaging tool for measuring CVR impairment. This study was supported by a grant from the Korean Health Technology R&D Project, Ministry for Health, Welfare and Family Affairs, South Korea (A070001). Paper previously presented at: Annual Meeting of the American Society of Neuroradiology, April 22-27, 2017; Long Beach, California. Accepted after revision September 4, 2017. You are going to email the following Can Arterial Spin-Labeling with Multiple Postlabeling Delays Predict Cerebrovascular Reserve?